Let's add in some helpful text when a user hovers over the language selection in the search box (that we recently A/B tested). The helpful text would indicate what language the user will be searching in. debt raised the priority of this task from to Needs Triage. debt added projects: Discovery-Portal-Sprint, Discovery. debt added subscribers: debt, Deskana, JGirault. I'm assuming the helpful text should be in the selected language? Where would we pull these labels from? This design (show on hover) is not helpful for mobile users. I'd rather take a mobile first approach. translatewiki.net is the standard way to do this. It has a lot of translators that translate messages for projects like this. We'd need to figure out the mechanism by which the portal can hook into that workflow. Although that's an open question for us specifically, there are plenty of examples of non-MediaWiki projects integrating the workflow; for example, the apps have their own i18n directories, and a script which syncs with translatewiki, uploading new messages in English for translation into other languages, and downloading new translations. You can take a look at an example of what that script does. Perhaps we could have a similar setup here. Good point. What do you suggest? Long press? Sounds like something to explore. There is no good answer to this unfortunately. Tooltips don't work very well on a touch screen, they are purely designed for desktop apps. Displaying some text underlined with dots usually means it is not a link but there's something interesting when you tap on the text. Put a (i) icon next to some text and the user knows there is helpful information when you tap on the icon. In our case, the text that needs informative help is a dropdown. I don't see how we can display informative text "on demand" on touch devices. That's why the mobile first approach is best to avoid design mistakes (@MSyed). And when you design for mobile, you don't focus on a feature on screen (search language) but on the screen itself (site language) - because you have to leverage the entire screen space. is the user's story to select the language of search results? is the user's story to select the language of the screen (and an admitted consequence is: search results come in the language of the screen)? Depending on these answers, you may design totally different UIs (@MSyed). A settings link/icon that would open a configuration screen (full size) where you can more easily display "Language of Search Results" and a language picker (Google like). Hi @MSyed - can you take a look at the comments above and let us know if you think it's ok to have a desktop "only" solution to this or can you recommend one that will accommodate mobile and desktop helpful text for the language selection? debt moved this task from Needs code review to Design Work on the Discovery-Portal-Sprint board. I think for now a desktop only solution to this is fine. I can't think how we can accommodate this better on mobile without taking more space. And on mobile, space is even more precious. 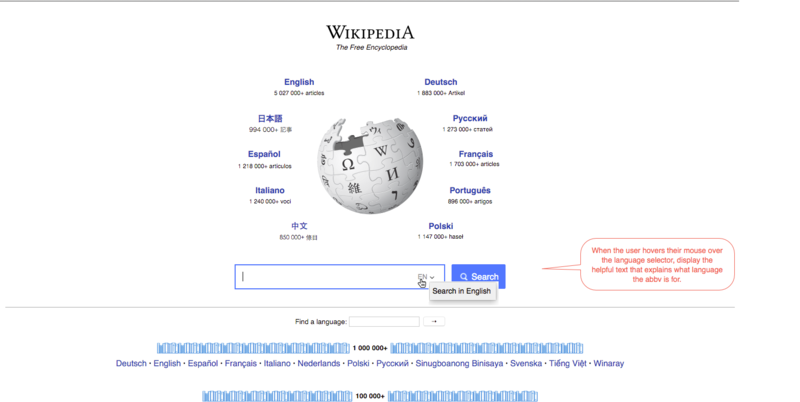 Added in a new story to investigate how we can use the translatewiki.net workflow. debt set Security to None.